An award winning restaurant management cooking by Flipline Studios – Papa’s Pizzeria: truly an epic game, awesome for kids and teenagers, even adults: The entire game process is a pure fun, nothing complicated and confusing. Just take orders from customers, cook pizza, work on toppings and serve it to customers. Quality matters though, even simplest things like how to cut pizza and how long it’s to be cooked are critically important in Papas Pizzeria game. If this is the first game for you, from papa’s games series, make sure you check the “help” tab inside the game interface, all aspects of the game, tutorial and everything else you need to learn how to play can be found in it. So, the thing is, you have to run the Pizzeria while the Papa Louie (the original owner of the restaurant) is gone. For this you have to learn how to take orders from customers, how to cook, bake and top pizza, how to cut and how to build it to its final shape. While the game isn’t hard to play and adapt to, it is all about multitasking, or at least it gets when numbers of customers keep growing and you have to work on several orders at same time. To keep up with all the customers in the queue and watch the over not to burn your pizza is not an easy task, but the balance in game is flawless, it only gets slightly difficult when you are well adapted to the game mechanics and ready for more. During the game, player will get notifications / tops of how to improve ranking and gain even more customers. One of the most important aspects of the game is knowing how to interact with customers, okay this may be a slight exaggeration but the point is, you should learn more about your customers to keep the satisfied and happy, not to make them wait too long and not to disappoint them with orders. Disappointment is not your friend, first of all, when customers aren’t happy with the order, they will pay less and if you keep disappointing them, they won’t come back. It is also very important to know how to read order tickets: The first thing you see (on top of the order ticket) is the number of order, this is important for you to prioritize the orders. Order ticket will also show the area of the pizza and sorts of ingredients you need to use and their amount, also toppings, how long it’s to be cooked and how to cut it. Another thing about tickets you need to know is how to move them. Simply drag the order ticket to the ticket line (you’ll find it hanging across the top of the screen for storage. Now whichever order you are working on, ticket for it must be dragged to the side panel so you can clearly see the ingredients and other components needed for the order. Once you’re done with the current order you can either drag the other ticket over the current one or remove the first ticket from the panel first. All the ingredients and toppings are placed on the bucket, you can use your mouse cursor to drag them onto the pizza. Once done with toppings, click “into oven” and begin baking. When working with multiple customers, oven is frequently occupied by other order so you click “save for later” and put it in the baking queue. When working with toppings, make sure you distribute them carefully, accurately and evenly onto the pizza, this is important because if you make pizza looking like a burger, customers won’t be happy with the order. Here is another thing you need to remember, let’s say according to the current order you need eight peperoni on a full pizza, make sure you put 2 in each quarter. Watch out not to lose points, don’t make critical mistakes such as using wrong toppings or wrong numbers of toppings. And also, as mentioned earlier, you will lose points if the toppings are not distributed evenly. The key is to divide the pizza horizontally and vertically, not at an angle. Baking is the major part of the cooking process in papa’s pizzeria game. First thing to remember about this process is the watch the timer all the time once you place the pizza into the oven. Order ticket shows the time pizza needs to be cooked, when the timer on the screen matches the image of timer on the ticket remove the pizza out of the oven immediately. Each oven can bake 8 pizzas at same time. One more thing, besides the timer, watch out the color of the pizza in the oven, it will start changing during the baking process. What you can learn of all this is that you get more points when you get close as possible to the correct cooking time. If you overdo it, will lose points. Cutting pizza is no less important for customers as the other aspects of the game. First of all, learn how to cut pizza: Click and hold mouse on cutting board outside of the pizza. Drag the mouse across the pizza body and release the mouse on the other side of outside the pizza to cut it. When done with cuttings, don’t forget to click “finish order”. Just as you do with Baking process, make sure you do everything according to order ticket: this means you have to cut pizza as close to the ticket image as you can. It is also easy to lose points during cutting; like with wrong number of cuts or if the cuts are off center. Full manual and step by step instructions are provided inside the game interface. 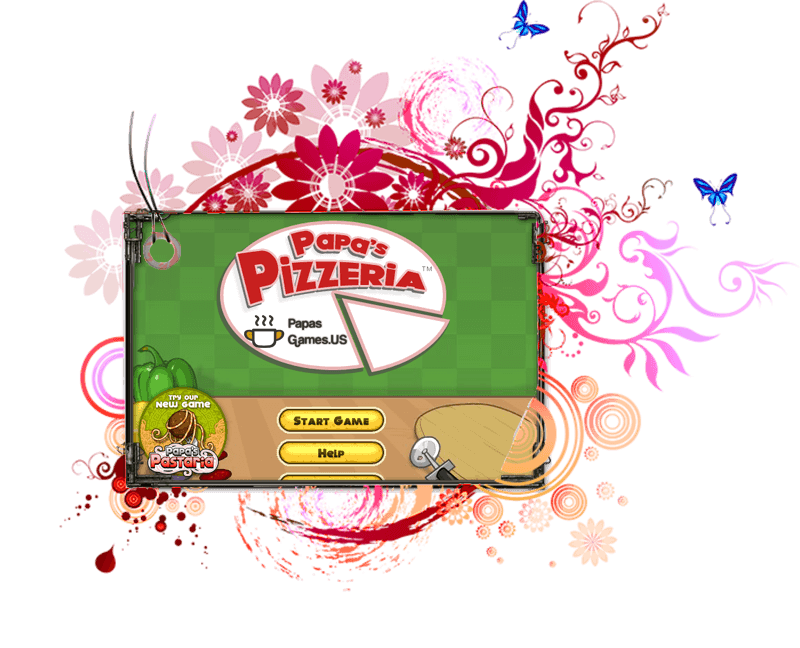 Enjoy the epic Papa’s Pizzeria game and don’t forget to share it with your friends.